The earliest formal introduction of a spring-bayonet fencing musket was in 1863, when approval was given to a design submitted by Wilkinson & Son for a musket suitable for use "in gymnasiums". 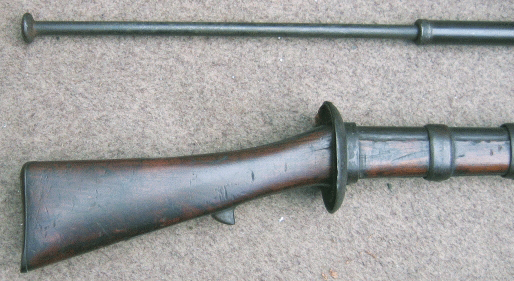 The "spring" for the bayonets was, until a modification, made of India rubber. Perishing rubber necessitated this alteration approved by a List of Changes (LoC) entry No. 5770 of 13th. March 1889. Replacements were made as originals became unserviceable. The style of musket with handguard, shown in the images below, was introduced, as the Mk.IV, in 1894, shortly after approval of the Martini-Henry Service Rifle, and was amended, with small modifications, to the Mk.V in 1896. Three years later a stronger bayonet was introduced, and replacements made as failed units were returned to stores. There was no change in nomenclature of the musket. By 1902, the introduction of the Mark VI saw the use of ash wood, whereas previously walnut had been specified. A further model, given the nomenclature " Musket, fencing, short (Mark I), was approved and a pattern sealed on 14th. November 1904. This short version was to provide a representation of the just introduced (Rifle, Short, Magazine, Lee-Enfield), also then known as the "new Short Rifle". In addition to the purpose-built muskets here illustrated, in September 1907 another completely new model was approved - the Mark II version of the Musket, fencing, short. This was a conversion of the Martini-Henry rifle, itself already having been superseded by the bolt-action Magazine Lee-Metford/Enfield long rifles and, indeed, the even more recently introduced and just mentioned S.M.L.E.. Being of similar overall length to the latter weapon, the Mk.VII fencing musket was also issued to units holding that comparatively new "Short" rifle. A further similar conversion, approved in in March 1909, became the "Musket, fencing, Mk.VII" . The Mark VIII and IX muskets were both introduced in April 1912. The former being a conversion of the Rifles, M.E., Mks.II & II*, whilst the latter was converted from the Magazine Lee-Metford Mk.I*. An additional new pattern, notated the Mark X, was approved on 28th. August 1913, within sight of the Great War. The Marks IV and V muskets were declared obsolete in October 1909. By 1925, all Marks to IX had been declared obsolete, with only the Marks X, No.1 and No.2 remaining in service. The Greener Company manufactured many rifles and shotguns, but one of their lesser-known wartime products was a fencing musket. These "weapons" were used for bayonet and hand-to-hand fighting practice. Two versions are illustrated above. The upper, longer, example is the Greener product. The lower item is completely unmarked and of unknown manufacture, since quite a number of manufacturers were contracted to build these training devices. a hand-guard and under-lug to prevent the hand slipping back in use. into the musket body when pressed against an object. with the year of manufacture and their company name and factory address. "Broad Arrow" mark is most prominent. The removal of the action and its replacement with a wood infill is below evident. 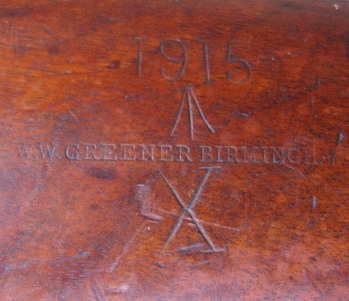 The markings below, of the original rifle, should afford an opportunity to detect which Mark is being viewed! Fencing muskets, of the type shown earlier made by Greener, were produced right up to the end of the Second World War by several companies, including Webley & Scott, Westley Richards. The Birmingham Small Arms Company converted one of their commercial Mk.III S.M.L.E. rifles to the unusual fencing musket configuration shown below.